"...an untried candidate, to be sure..."
"Obama is not without flaws." "For all his charisma and his eloquence, the rookie senator sorely lacks seasoning..."
Who knew that the Roman Catholic Church observed something called "World Communications Day"? Well they do, and the theme for the 42nd annual observance to be held on May 4, 2008, was addressed in a speech by Pope Benedict XVI. He had some interesting things to say about the media. To begin with he recognizes the massive shadow cast by modern media conglomerates. "Truly, there is no area of human experience, especially given the vast phenomenon of globalization, in which the media have not become an integral part of interpersonal relations and of social, economic, political and religious development." "We must be prepared to match actions with words by seeking out every creative means of protest possible." One such reporter appears to have succumbed to the siren call of amour on the campaign trail. Sources have revealed that the fittingly macho-named Major Garrett is tied romantically with the disgraced "non-gay" senator from Idaho, Larry Craig. While there has been no confirmation at this time, the sourcing is "strong, very strong." Garrett is the reporter who covered the Craig affair for Fox News. And while the photo at the left may not be considered conclusive evidence, it raises the temperature of the scandal significantly. Any fair-minded observer of American media is well aware of the intrinsic bias of Fox News. It is a bias that is recognized by journalists and scholars, analysts and amateurs. Even Fox no longer tries to pawn the euphemistic "fair and balanced" nonsense off on their viewers. They now cast themselves as "the most powerful name in news." That slogan should provoke an obvious question: Is "power" something that is desirable in a news network? Many divergent camps in politics and media are answering that question with a resounding "NO!" Those camps may now be coalescing into a united front that shares a healthy disrespect for Fox News. Edwards Support Up 44% This Year. Why Isn't This News? Rassmussen conducts a daily national tracking poll of all presidential candidates. The latest shows John Edwards picking up significantly more support, since the beginning of the year, than any candidate of either party. The percent change for Republicans is: Huckabee 18.8% / Giuliani 13.3% / McCain 11.8% / Thompson 8.3% / Romney -6.3%. So why isn't this news? Read more about Edwards Support Up 44% This Year. Why Isn't This News? "...build Beck into the type of TV personality that could siphon viewers from Bill O'Reilly, Joe Scarborough and other conservative hosts." Beck's ratings for November 2007 (25-54 demo) reveal a program on life support. At this point the humane thing to do would be to pull the plug and put Beck (and innocent TV viewers) out of their misery. As shown here, Beck loses to all of his competitors in cable news. Both his live show and his repeat come in 4th out of four programs. That doesn't leave much for him to brag about. But that's not the end of his problems. "When all is said and done, The Media will have banked over $2 Billion [...] If a campaign can be analogized to a war, then the media are the war profiteers. Fox is the Halliburton of the press corps - GE (owner of NBC/Universal) is the…well, the GE. They benefit no matter who wins or loses. In fact, it is in their interest to incite division and to escalate the conflict." 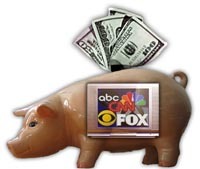 At the time, the money raked in by media was a new record, but one that was destined to be short-lived. The ongoing strike by members of the Writer's Guild against the AMPTP is an important line in the sand for rights of the creative community in Hollywood and elsewhere. The producers have thus far proven that they are far more interested in hording their profits than in sharing credit and compensation with the people most responsible for generating those profits - the creators. But there has been an unanticipated drawback to this otherwise righteous cause that could have a significant impact on our nation. A month from now the first of the presidential primary contests will take place in Iowa. The campaigns are already at cruising speed and the media is hurtling forward with their usual fare of speculation, conflict and the inane horserace chatter that they think passes for news. What's missing is the perspective of what has become the most insightful segment of the commentator class in the 21st century - Satire.